In St John’s Wood Burial Ground, not far from Samuel Godley’s grave, lies Joanna Southcott. Joanna Southcott, a mad prophetess, spent the first 42 years of her life working as a domestic servant in Devon. She was then brought to London, paid for by the engraver William Sharp, as a religious prophetess who purported to have super natural powers and announced herself to be the woman of the apocalypse. Her fame was such that she is mentioned at the beginning of A Tale of Two Cities! 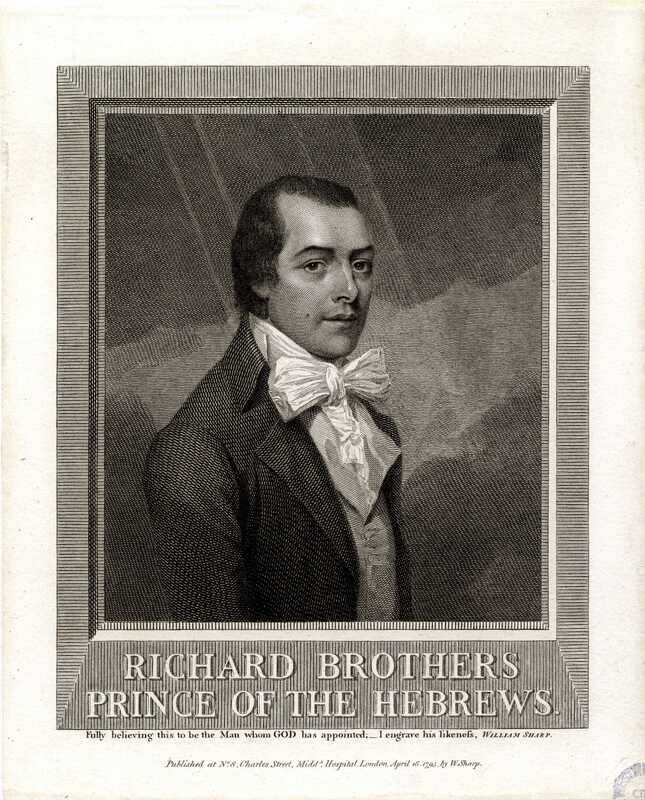 William Sharp had previously been involved with a number of other prophets including Richard Brothers who he’d abandoned when Brother’s prediction that he was to be declared ruler of the universe failed to come true. 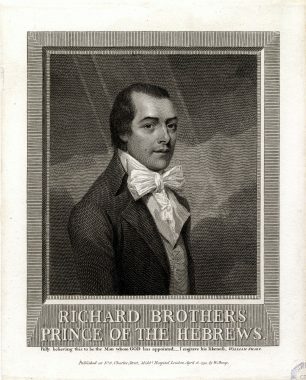 Brothers was later confined to an asylum (several of Sharp’s engravings relating to Brothers are also in the Archive’s collection). harp used his engravings to promote Southcott, including selling thousands of seals which would guarantee the bearer entrance to heaven. Aged 64, Southcott announced she was pregnant with ‘Shiloh’, the heavenly baby never materialised and she died just two months later. Initially, her followers refused to allow her to be buried, insisting she would return to them. These are some of Joanna Southcott’s papers, which are kept in the Westminster Archives. She left behind her a box of writings to be opened in a time of national strife in the presence of 24 bishops. There have been a number of campaigns to have the box opened and a number of claims that the box has indeed been opened in dispute. A verifiable claim, names its contents rather unremarkable! This page was added on 28/04/2017.